OECS Chairman Ralph Gonsalves and Ary Chalus, President of the Territorial Council of Guadeloupe, sign the agreement making Guadeloupe part of the OECS. 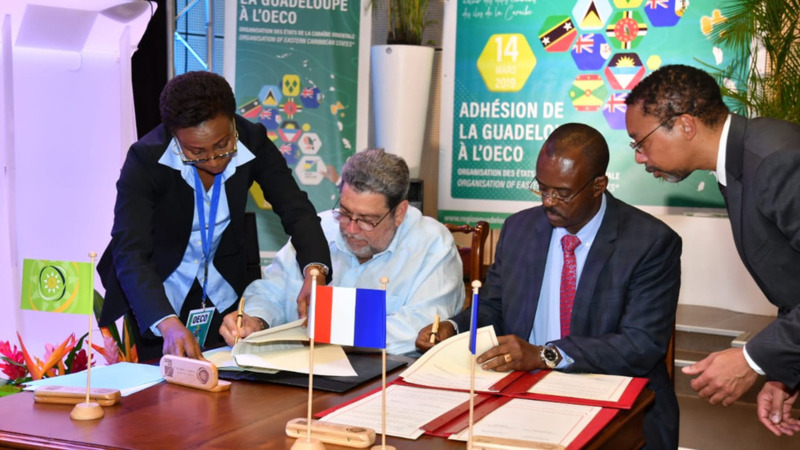 Guadeloupe, an overseas Department of France, has formally joined the Organisation of Eastern Caribbean States (OECS). The OECS is a regional grouping comprising the independent and non-independent countries of Antigua and Barbuda, Commonwealth of Dominica, Grenada, Montserrat, St. Kitts and Nevis, Saint Lucia, St Vincent and The Grenadines, British Virgin Islands, Anguilla and Martinique. The Ceremony officiating Guadeloupe as an Associate Member of the Organisation took place in Basse Terre, Guadeloupe on Thursday, March 14, at at the University des Antilles, Basse-Terre. 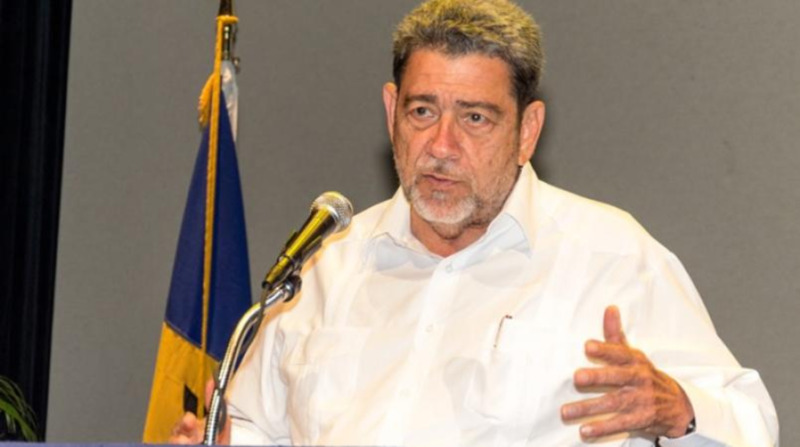 In welcoming Guadeloupe to the organisation, OECS Chairman and Prime Minister of Saint Vincent and the Grenadines Dr. Ralph Gonsalves questioned how an expanding OECS would affect the geopolitics of the region. 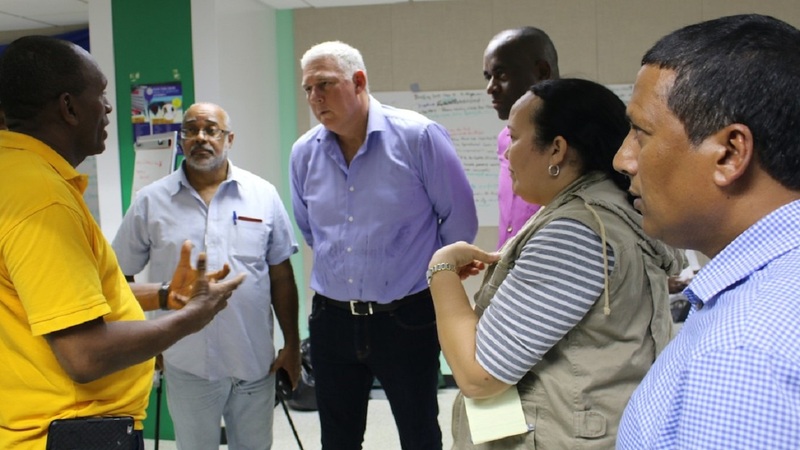 "Before our very eyes, the regional integration movement is being transformed with the entry of both Martinique and Guadeloupe as associate members of the OECS. Is Barbados next? What about French St. Martin and the territories which are called “the Dutch Antilles”? Is there emerging an enlarged south-eastern and northeastern pole of regional integration? How would Trinidad and Tobago, Guyana, and Barbados react to all this in any reordering of regional integration? "Would there be a reconfiguring of CARICOM itself with the emergence of a north-western integrated pole of Jamaica, the Bahamas, Haiti, and perhaps the Dominican Republic and in time, Cuba and Puerto Rico? Would the altered, and altering, global political economy, its knock-on regional reverberations, and regional home-grown alterations demand a reordering of the regional integration movement to accommodate a flexible variable geometry of integration as the circumstances admit?" he asked. He said the enlargement of the OECS, with the accession of Guadeloupe to associate membership, opens up tremendous possibilities not merely to survive but to thrive more markedly. "We are, in the process, moving from a shared experience to a conscious expression of our Caribbean reality; and we seek in a structured way to channel the people’s activism to desired ends in programmes material and non-material, visible and invisible, reflecting the genius of our people, of our Caribbean civilisation. Without an enhanced people-to-people contact, an embrace in the spheres of the economy, society, culture, and polity, our progress would be stunted. The Revised Treaty provides the framework for deeper cooperation and integration but the governments and our people must make it all work for their benefit and development," he said. In his address, President of the Territorial Council of Guadeloupe Ary Chalus said his island shares a united destiny with the rest of the Caribbean. 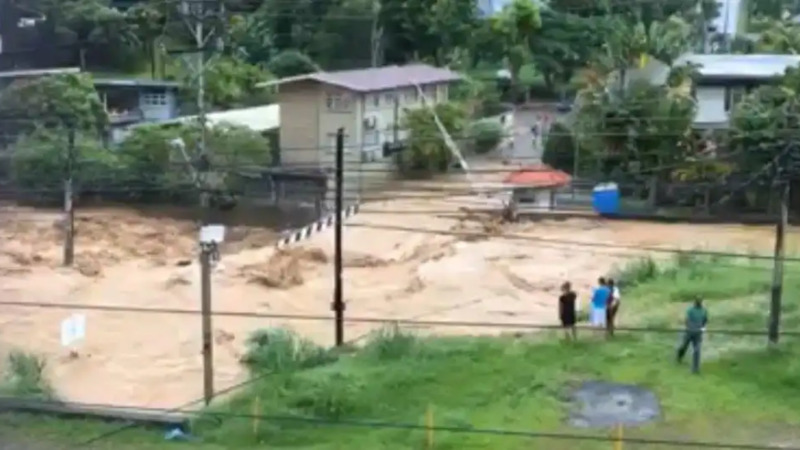 "With you, Territories and Governments of the Caribbean, we share a united destiny; island economies, territories vulnerable to climate disruption and the need to face the same challenges in terms of energy supply. Guadeloupe is resolved to contribute to the vision, shared by all of you here, whereby the green and blue economy is promoted in such a way as to make the Lesser Antilles region the world’s reference for sustainable territories. "Its triple allegiance to the Caribbean, France and Europe must be approached pragmatically since, like Martinique and Saint-Martin, this offers Guadeloupe substantive development opportunities and enhances the contribution it seeks to make to the OECS. Education, training, promotion of excellence of the health system, energy self-sufficiency, wise development of our rich natural heritage and biodiversity, capacity building of our territories to respond to environmental challenges."